When I teach my cooking and nutrition classes, a frequent question asked is "what is my favorite gadget or kitchen tool?" I don't hesitate in my reply. However, my response isn't what they expect - some cool, unusual tool that does something fancy and clever. No, my favorite tool has to be my kitchen timer. It is definitely my favorite because without it, I'd hardly cook anything successfully! I'm one of those people who becomes very focussed on what she is doing. So if I've put something in the oven for 20 minutes or so, I then move onto doing something else and my attention has a new focus. Then suddenly a bell rings and I'm reminded that something else is going on! I can't tell you how many meals or dishes I'd have ruined without a kitchen timer. Every time something goes in the oven I know I have to use the timer. That's just the way I am! But in a way, my timer isn't just a basic timer. It is a four way timer, meaning that I can time 4 different things at 4 different times. This is really useful in classes when 8 people are cooking different things. I assign them a number and when the timer buzzes, I just read out the number on the timer and they know who its ringing for. Surprisingly, I also use all four timers just when I'm cooking alone too. I love multi-tasking and if I'm cooking, I can be doing lots of cooking. 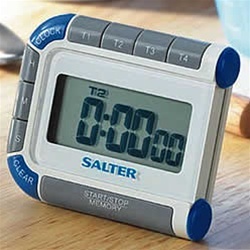 So then the only tricky bit is my trying to remember which dish is timer 1 and which is 2 and 3, 4!!! My mum bought me this timer a few years ago in England. Good choice mum! 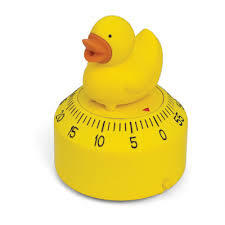 This duck timer was bought for me for Xmas by my hubby. When the time is ready, he quacks. The only problem is, he quacks randomly also. He sits happily in the drawer and all of the sudden, nothing has happened, but we hear this quacking noise! He does 3 or 4 quacks and then shuts up for a couple of days, and then starts again! He's not a great timer and my husband has suggested throwing him away - but I feel there is this sort of life to him and it seems too mean to throw him! Also, it brings a smile to your face when you suddenly hear this quack, out of the blue! What's your favorite kitchen gadget? Is it fancy or is it just a life saver? Do tell.